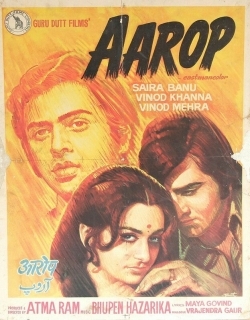 Aarop is a 1974 Indian Bollywood family drama, love triangle, social film released on Jan 01, 1974. The film is directed by Atmaram, produced by Atmaram. Aarop is the story of three-friends Subhash (Vinod Khanna), the fiery editor of a weekly newspaper calles Mashal, Aruna (Saira), a school teacher who helps to run the paper, and Ravi (Vinod Mehra), a lawyer and a poet, in the small hill town of Nandganj, their romantic involvementand their fight against injustce in the town. . When the story opens, Subhash is being sentenced to Six months jail for defaming the most respected and powerful citizen of Nandaganj, Singh (Rehman). 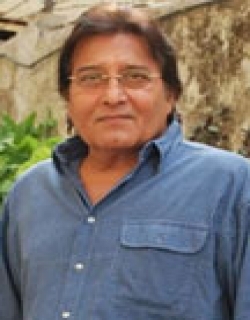 Aggresive in his fight for truth, Subhash prefers imprisonment to giving an apology to Singh and the court. Ravi, Subhashs dearest friend, promises to run the paper in his absence. . Aruna an orphan brought up by a temple priest (Bharat Bhooshan) comes in contact with Ravi and Mashal during Subashs absence and begins to work for them in her spare time. Ravi falls in love with Aruna but does not express his feelings to her. Dhondu (Johny) the owner of the press, his sharp wife Kalavati (Savita), the enthusiastic manager of the press, Kunwarelal (Kesto Mukherjee) are part of the Mashal family. who have by now accepted Aruna in their fold. . Subhash return from jail, and resumes work at Mashal. Aruna is carried away by his strong personality. She was an admirer of his writing even before she met him. Her admiration grows into deep affection for Subhash, of which he is not aware, Ravi, in the meantime has returned to his law practice. . Singh has introduced vice in a big way in Nandganj by starting " Teen Ekke" a drinking and gambling joint for his mistres, Kanchan (Bindu). "Teen Ekke" has been legally licensed by the Town Council which is very much in Singhs grip. The introduction of satta in his small town begins to ruin many families where the men take of gambling. Subhash takes up the fight against "Teen Ekke" and Singh vigorously. . Ceaser (Gulshan Arora), a ruffian from "Teen Ekke" in a fit of jealous sets fire to the Mashal Press and brings on the wrath of the people of Nandganj. Led by Subhash and Ravi, the people intimidate the town council to withdraw the licence to "Teen Ekke". Singh whose word has been law, is infuriated. He decides to take steps that will anhiliate Mashal once and for all. . Subhash has by now come closer to Aruna, still unware of Ravis feelings for her. Events take a dramatic turn, when Aruna loses her job in the school, Ravis cliets turn away from him and the newspaper agent refuses to sell Mashal. The three decide to seek the help of Ravis college friend, Mukesh (Rajesh Behl) who has been helping them with advertisements etc. so far. . Subhash, Ravi and Aruna go to Mukesh with high hopes, but they are shattered when Mukesh advises Subhash to compromise with Singh. He refuses to help them any further. Subhash realises that Singhs long arims have reached Mukesh as well. He is very bitter. . Ravi, meantime, gets drunk at Mukeshs party and confesses for the first time to Subash that he as in love with Aruna. He tells Subash to tell Aruna on his behalf. 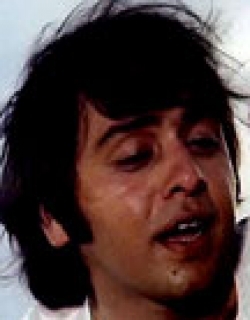 A dazed Subhash nods his head. Aruna is still quite unware. . When Subhash returns to mashal, a greater shock awaits him. Dhondu, who has secretly a slave to satta has lost his press in gambling to Kanchan. Subhash grimly watches all his things being thrown out by Ceaser and his men, while Dhondu, his wife, and Kunware sit outside and weep in desperation. He picks up an old souvenir of his father, a revolver which he had never used and leves the Mashal press swearing to kill Kanchan. [Source: Booklet] Check out this page for more updates on Aarop. This page provides latest and updated information about Aarop (1974) movie which released on Jan 01, 1974. 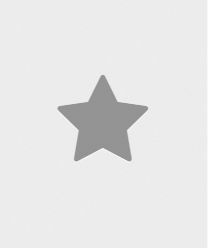 Aarop (1974) is directed by , produced by , starring .We have also provided 0 trailers and videos, 3 photos, 5 user reviews, and 0 critic reviews.Aarop (1974) has received 3 rating from user reviews.The overall rating of Aarop (1974) is 60 and movie is 3.You can review, like, dislike this movie and also can add to favorites. You can also find information on showtimes, CDs, DVDs, online rental, online free watching.